Swimming Through Clouds is a deep, sometimes quite dark, and very emotional YA story. Honestly, without the sweet developing friendship between the main characters, I'm not sure I could have stomached this story for long. I felt so much sympathy for Talia; her situation at home is heartbreaking. Poor Talia has experienced a nightmare of events with an abusive father. My eyes are tearing up just thinking about her home life. I can't imagine how she found the strength to hold it together when so many would crumble. It took such great courage for her to start opening up to Lagan. It instilled such hope to see her begin to change after Lagan's acts of kindness. Lagan is really an amazing teenager. While most teenagers are self-absorbed, he goes out of his way to offer kindness to a lost soul. He was a ray of sunshine in a dark, difficult read. I loved Lagan, adored the scenes with him. This novel contains some pretty graphic descriptions of abuse which bothered me quite a bit. There were times when I was desperate to put the book down but also desperate to continue the story. Ms. Paulus has a knack for making the reader care for her characters. They are all quite well-developed. The budding relationship between Talia and Lagan was adorable and sweet. 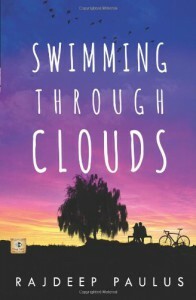 While I did enjoy Swimming Through Clouds, I must warn readers that this is an emotionally turbulent novel. There are scenes that some readers may find difficult, if not impossible, to read through. It truly is a beautiful story, even with all the ugliness Talia experiences.